I remember the first time I ever had a French Dip Sandwich. I was probably about 10 years old. I was invited to spend a week with my best friend’s family in Colorado. Which was super exciting. On our way there we stopped at a restaurant near the four corners and ate. My friend said you have to try this French Dip sandwich. I literally had no idea what she was talking about, but I ordered it. And it was super delicious. Which is a big reason I create my own crockpot French dip sandwiches recipe. I remember after that trip I really loved a good French Dip Sandwich. I’ve spent 20 years now ordering French dip sandwiches and restaurants all over the country. That might sound silly, but it is totally true. When I look at a menu, if they have a French dip, I have a really hard time not ordering it. Some recipes are with shredded roast beef, some are just a cut of roast beef, others are deli roast beef. You name it, I’ve tried it. It is safe to say I’m a pretty good judge of a decent French dip sandwich. Naturally, I had to make my own recipe so I could enjoy the same yummy taste right in my own home. That’s how I came up with my Crockpot French Dip Sandwiches. Perhaps you are wondering why it is for the Crockpot or slow cooker? Well, I’m a busy mom. I am constantly running my kids around from here to there. And frankly, I don’t have a lot of time to think about dinner. In fact, my parents recently moved in with us for a short time and I think my mom was super surprised by the fact that I don’t do a lot of planning ahead of time for meals. Yes, I have a menu plan and I use it. But I also am very good at winging it with whatever we might have. I love this crockpot French dip sandwiches recipe because I can toss the frozen roast beef into the crockpot in the morning and not think about it all day. When I come home I pull out the beef, shredded it a bit and toss it on a toasted bun or some yummy sourdough bread. It is the perfect fall and winter dinner, but we eat it year round. But if I’m really on my game, I’ll make a yummy roast for our Sunday dinner and use the amazing leftovers for dinner on Monday night!! Instead of just using it for one meal I get 2 meals out of it. Brilliant right? See, I totally plan ahead! If you are thinking, never gonna happen. I can’t remember to throw the roast in the crockpot. Don’t worry, I don’t always remember either. So instead, I have deli roast beef. Just pop open a package or get yours sliced fresh at the deli. It tastes yummy too and will save you time and your memory, since you don’t have to cook the whole roast. Anyway, let me share with you why my kids love Crockpot French Dip Sandwiches. Second, my children love roast beef. It is a staple for Sunday meals so they are use to eating it. But even if I don’t use a Sunday roast and I buy store bought deli roast beef, they still love it. Yep, that’s right. You don’t have to make an entire roast for a successful French dip. But it is SO good, you probably want to. If you aren’t sure, just tell your kids you made chicken for dinner. They’ll totally believe you. Third, cheese. My children love cheese. They eat it all the time. They would probably use it as soap if I would let them bathe in it. But I don’t. So don’t worry. Since crockpot French dip include cheese, they are satisfied and will eat them. Let me tell you, I have fun changing up the cheese too. They’ve tried all kinds of cheeses and have no idea that I did anything different. See, I’m totally winning at this exposing my kids to different foods thing. Finally, they love that they get to dip their sandwich in au jus sauce. I think it is because things get a little messy and children LOVE messy things. So they get to dip, slurp and eat something super yummy and it is like playtime in the kitchen. Always a plus. And so you know, I don’t make my own au jus. Yes I could use the roast drippings, but I don’t. I am more than happy using the store bought packages. Someday I might be awesome enough for homemade au jus. That day is not today. So there you have it. 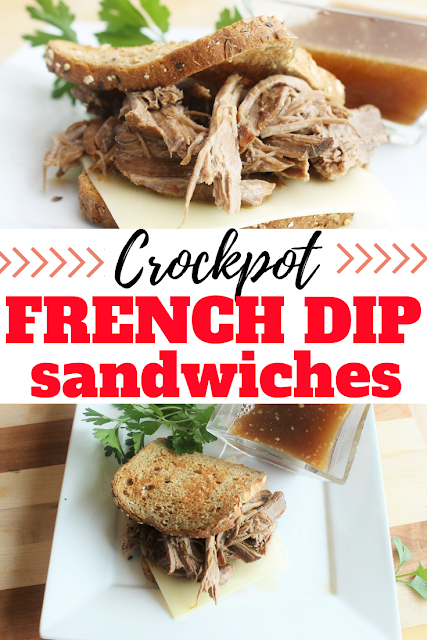 All the reasons my children love Crockpot French Dip sandwiches. If your children are anything like mine, I think you can try it out and see if they’ll like it. And if they don’t like it, make it anyway! It is so delicious, you can reward yourself for being a great mom and exposing them to new and healthy foods. Just don’t try introducing broccoli on the same night. Delicious roast beef sandwich on sourdough bread, dipped in au jus gravy. Place frozen roast into Crockpot and top with 1/2 of the sliced onion, the onion soup mix and 1/2 pkg of au just gravy. Cook on low for 6-8 hours or high for 4-5 hours. Remove roast from Crockpot and place on a plate to allow juices to cool. In a pan, add 1 Tbsp oil and saute remaining onion slices until caramelized. Add 2 cups water to pot and whisk in remaining Au Jus packet. Place on stovetop on medium heat until simmering. Toast sourdough bread in the oven on broil until golden brown. Flip and toast opposite side. Add slice of cheese to warm, toasted sourdough bread. Top bread with shredded roast beef and caramelized onions. Ladle Au Jus sauce into bowl and dip.